While paying tribute to an iconic era of craftsmanship, the Georgian style is a modern day in-frame kitchen. Both the design and construction techniques are modelled on master craftsman from the Georgian period. It is taking these details from the past that enables us to make a kitchen that is not only classic but timeless. The characteristics of the Georgian range showcase a much more rounded style compared to the square frame of a Shaker. The Georgian period was a hectic and prolific era of building, the empire was influenced by many overseas styles and this was reflected in the furniture. Manor houses had paneling, grand staircases and Chippendale furniture. Key features of the style in included quarter turned pilasters with matching lathe turned cornice and skirting mouldings, quarter glazed wall cabinet doors and distinct furniture mantle with simple corbels and shelf. The most common woods used during the Georgian period were oak, walnut and painted hardwood. Most notable about the Georgian style is an absence of intricate carvings, preferring a much simpler and cleaner approach, which only adds to the contemporary feel of this British classic. 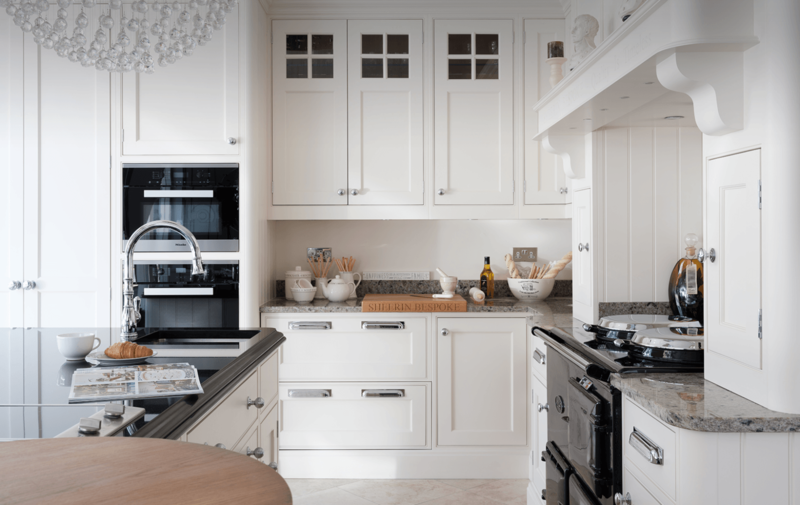 Key features of the style include quarter turned pilasters with matching lathe turned cornice and skirting mouldings, quarter glazed wall cabinet doors and distinct furniture mantle with simple corbels and shelf. Using the Georgian style, our craftsman are able to develop the design into handmade furniture such as wardrobes, bookcasing, sideboards, media cabinets and more.